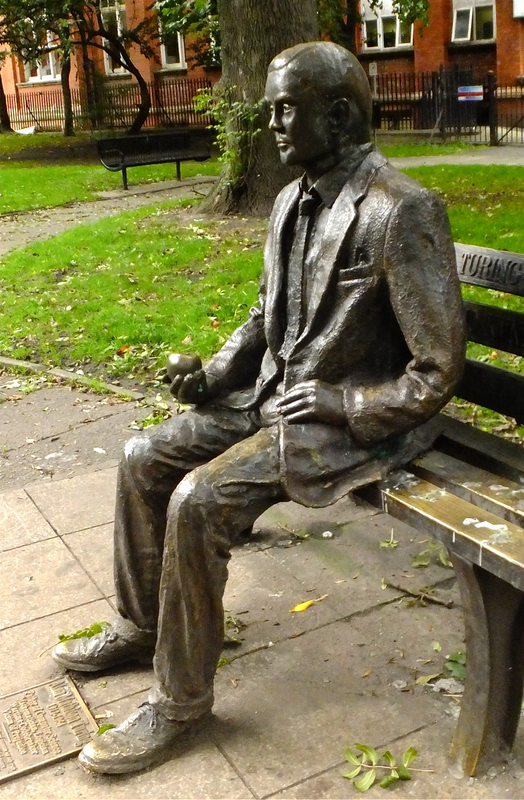 Although there are other eminent candidates, Alan Turing is probably the most famous single scientist ever to have worked at the University of Manchester. If it wasn’t for his work on the philosophical-technological basis of computing – the idea that a machine did not have to be built to perform one task, but could perform many, if it were given the right instructions – we might not be sitting here doing all these things we do with ICT. On the other hand, if he hadn’t been persecuted for his sexuality, and committed suicide as a result, who knows how much further the technology could have advanced. This memorial to him sits (literally) in Sackville Gardens, at the corner of Whitworth and Sackville Streets, Manchester.